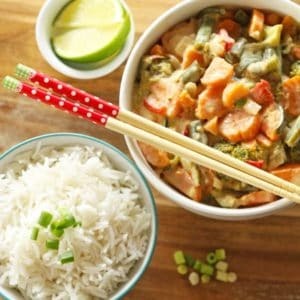 This Thai Green Vegetable Curry is much healthier and in my humble opinion much tastier than take-out! Who else out there loves a good old dance party while cooking up a storm? Often, I’ll be listening to a podcast while whipping up a meal but today I set YouTube to a mix list and let it do its thing and it’s been so much fun! I’ve had Elton John, Billy Joel, Westlife, Spice Girls, Backstreet Boys, Cyndi Lauper and Toto – a strange mix but I’ve been belting it out regardless. Some of the songs were giving me serious flashbacks to sitting in my bedroom trying desperately to record my favourite song on my cassette player when it came on the radio. Kids these days will never know the struggle! 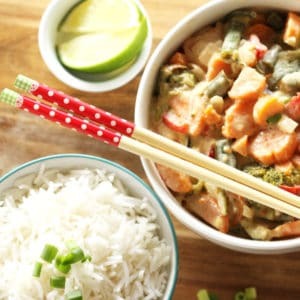 Anyway, I’m tearing myself away from my kitchen dance party to finally post this Thai Green Vegetable Curry recipe! I absolutely adore all things Thai food. Unfortunately, most Thai restaurants offer dishes that are delicious but far from anything we’d consider healthy. Never fear – that doesn’t mean we can’t draw from the flavours and create a healthy and tasty alternative from our own kitchens! This Thai Green Vegetable Curry packs in all the vegetables and a few extra seasonings and sauces to give you a well-rounded and delicious meal. I’ve been quite conservative with the addition of curry paste in this recipe to consider all different tastes. If you prefer your curry more on the spicy side live a little and thrown in an extra tablespoon. This dish really is simple to prepare so if you aren’t used to Thai cooking, don’t be intimidated and give it a try! Happy cooking friends! 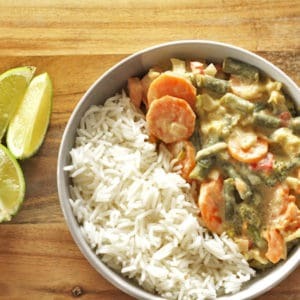 Add onion, garlic and ginger and cook for 1-2 minutes until softened, then add capsicum, zucchini, sweet potato, bamboo shoots, green beans, carrots and broccoli. Stir vegetables until slightly softened, around 2 minutes. Stir in the coconut milk, bring the mixture to a boil, then reduce heat to low. Simmer, uncovered, until the vegetables are fork tender (should be 10-15 mins). In a bowl, add vegetable stock, soy sauce and rice wine vinegar and stir to combine. Add this mixture into the pot and stir well to combine. You can also add some water if the curry seems too thick. Adapted from NY Times and Cookie and Kate. Yes! I’m all about the curry! I went to the Indian store last week and have been devouring Indian food every day ? thank you for telling me that I can make a sauce! Now I can’t wait to try this one!!! amazing recipe! keep up the good work!